This pattern is for all of the Dachshund lovers out there! The hat is seamless and is 3D in nature, but follows traditional beanie earflap and braid styles. 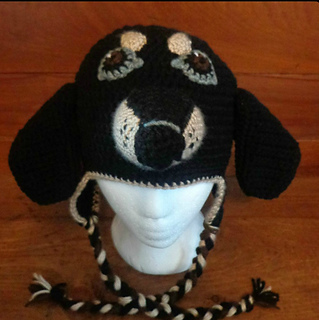 It uses 2 hook sizes (One Size to obtain gauge on hat, and one full hook size smaller (in mm) for the facial features) This method is meant to keep the dog in proportion while following the assembly instructions provided. It includes gauge for 3 sizes, Ladies, Child & Toddler. Swatching for gauge is essential for sizing. This is an intermediate pattern, written in English and using US Standard crochet terms. Pictures are provided to assist with assembly. Pattern purchase grants you permission to sell your finished hats.